If you don’t mind me asking, do you still think Gasosaurus is a coelurosaur? Which name would take priority? Both were named in 1984. Something I’ve been wondering since your post on testing Cau’s matrix… could Bicentenaria be a basal megaraptoran? Is this a reference to The Dinosauria or something else? "If you don’t mind me asking, do you still think Gasosaurus is a coelurosaur?" "Which name would take priority? Both were named in 1984." Kaijiangosaurus, since it was published in June, while Xuanhanosaurus was published in July. "Something I’ve been wondering since your post on testing Cau’s matrix… could Bicentenaria be a basal megaraptoran?" That takes 5 more steps in Cau's matrix, so seems easily possible. "Is this a reference to The Dinosauria or something else?" A reference to "Allosaurus" "robustus" astragalus described by Molnar et al. (1981, 1985) as allosaurid, and later identified as a megaraptoran similar to Fukuiraptor and Australovenator. Interesting stuff. The 'coelophysoid grade section' has a few quirks. Timurlengia braincase as a coelophysid? And here Podokesaurus isn't a coelophysoid (or even a theropod) at all - but has a much, much more basal position. Timurlengia is an example of "fragmentary taxa [that] can fall out in the wrong place due to both a lack of certain characters and the vagaries of tree generation", as TWG matrices through 2012 aren't great at placing braincases. Especially partial braincases like Timurlengia's. Its authors used Brusatte et al. 's (2014) version of the TWG matrix that included 255 of Brusatte's characters designed to sort tyrannosauroids. 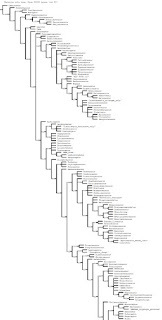 The Lori matrix uses 58 of those independently but most of Brusatte's only vary within tyrannosaurids, and we only included maniraptoromorphs in the manuscript analysis. 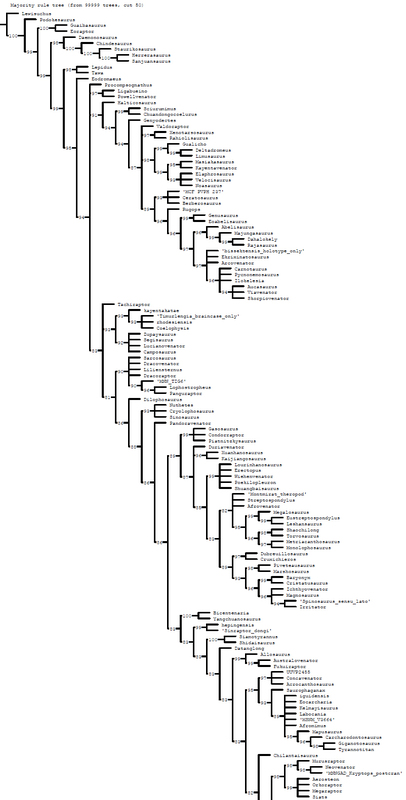 But tree generation is also important, since with so many fragmentary taxa that have multiple most parsimonious positions, even 99999 trees are just a tiny fraction of the true number. So what probably happened is that Timurlengia's braincase is Avepoda indet. as far as the TWG characters through 2012 are concerned, it fell out as a coelophysid in the first trees sampled and most of the 99998 permutations were moving other taxa elsewhere to test those OTUs. The case of Podokesaurus is probably similar since TWG matrices don't include most proposed avepod, eusaurischian, theropod, saurischian, etc. characters. Plus it's fragmentary with poor photos and illustrations of questionable accuracy, and not described well or in a modern context either. Incidentally, I think Yandangornis is a similar case, albeit more complete. But based on Lori results under different variables, I think it's likely the drawings and description are inaccurate, and the photos are also of poor quality. I hope it gets redescribed soon and doesn't become the Longisquama (or Sharovipteryx) of theropods. Thanks for your response Mickey. Good luck with the Lori manuscript. Yandangornis is a sadly neglected theropod.